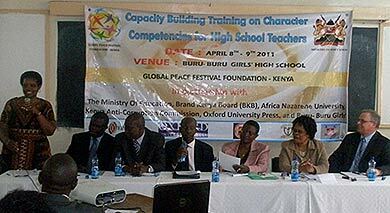 Principals and teachers from six pilot schools and other emerging schools attended a two-day character training workshop hosted by GPF Kenya at Buru Buru Girls Secondary School in Nairobi on April 8-9, 2011. The training emphasized educating and supporting morally responsible young people who can develop effective leadership skills in their workplaces and in civic life. Eighty-five teachers attended the training program. Brand Kenya CEO Mrs. Mary Kimonye opened the conference by stressing that national values should be translated into character competencies because good character is a learning process that enables people to understand, care about, and act upon core ethical values such as respect, justice, civic virtue and citizenship, and responsibility for self and others. “When you are patriotic to your country you will not be a tribalist,” she said, “neither will you be involved in corruption or commit any other vice.” Another aspect of character, she said, is recognition of the importance of passing on values, culture, and knowledge from one generation to the next, from teachers to students, parents to children, and employer to employee. principals and teachers in Nariobi, Kenya. Other presenters stressed the importance of exposing youth to an experiential learning environment that can build self-esteem and confidence around the principles of character, citizenship, entrepreneurship, peacemaking and excellence. Through effective character education, a new generation of Kenyans can be empowered to serve others across previously divisive boundaries of tribalism. Character Competency initiatives should even be used “as a criterion for promotion of teachers to department heads, deputy principals and principals to boost the effectiveness of the Character Competency implementation process,” said Mr. Wamocha, a Ministry of Education official. Education Kenya Anti Corruption Commission Principal Officer Dr. Arbogast Akidiva, African Nazarene Vice Chancellor Leah Marangu, and Oxford Press Sales Manager Mr. Oliver Olouch were among the distinguished guests.